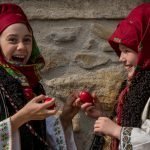 Christmas in Romania: what’s so great about it? 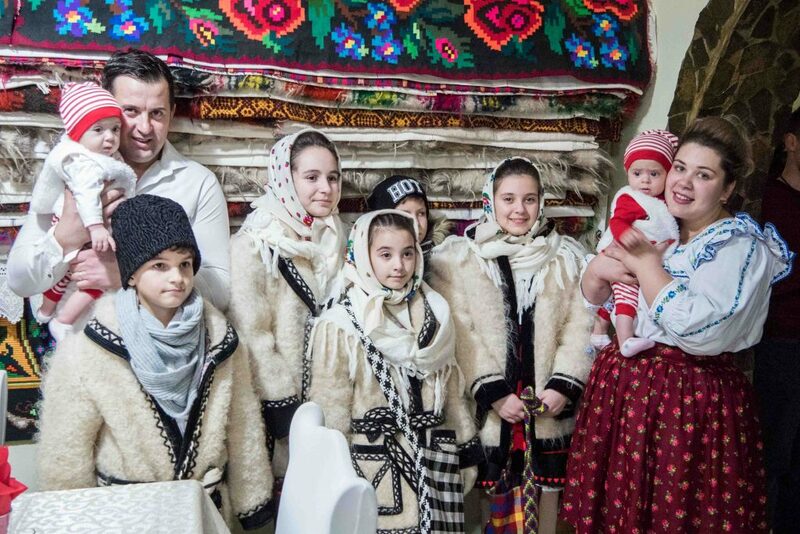 During Christmas in Romania well-kept customs and traditions come to life. 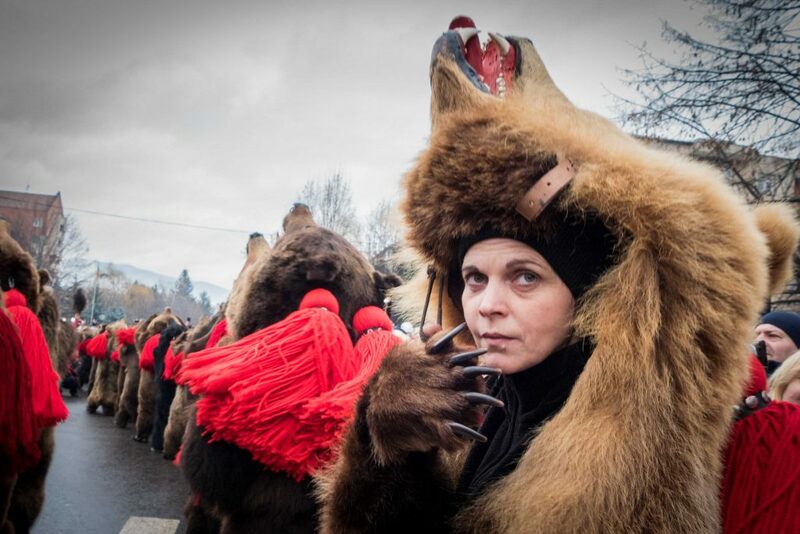 People dressed in traditional clothes sing carols, dancers wearing bears’ costumes wish for the passing of winter and in the countryside pigs are sacrificed in exchange for a rich Christmas meal. 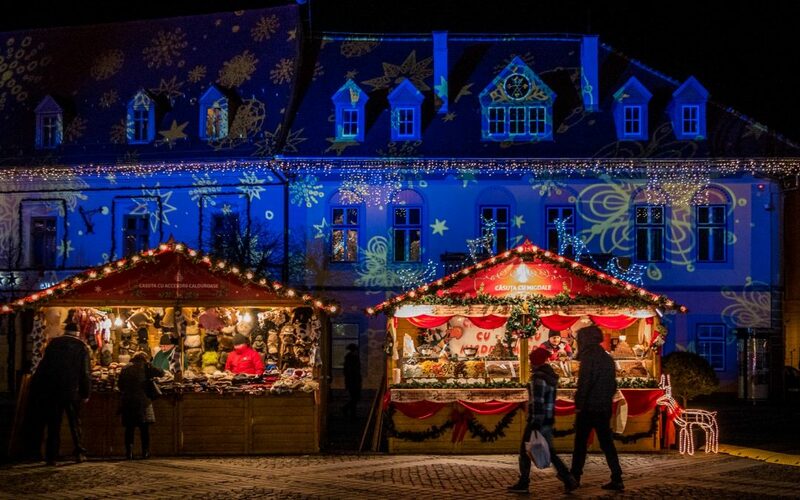 The festive atmosphere is completed by Christmas Markets and winter festivals. 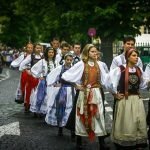 Read 9 of the most convincing reasons why Christmas in Romania is something else! 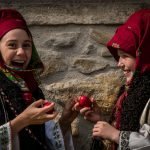 On Christmas Eve in Maramures children and adults carol their villages dressed in beautiful folklore costumes and are rewarded with home-made sponge cake, nuts, apples and pretzels. Most carols in Romania focus on Christian topics such as the birth of Jesus. But actually carols are thought to have pre-Christian origins, with roots in the old customs people performed to chase away the bad spirits and wish for a rich harvest the following year. Two of the most interesting such pagan customs are Dansul Ursului (the bear’s dance) and Brondosii (the “brondosi”). The dance of the bear is practiced in Moldova region between Christmas and New Year’s Eve. The Dacians, Romanians’ ancestors, used to worship the bear, which they thought was a sacred animal with curing powers. The bear’s dance symbolizes the death and renewal of nature, as the dancers wearing bear costumes try to depict the animal being beaten to death and then miraculously revived. The “brondosi” can be seen in Cavnic, Maramures region. Young people wear masks made of sheepskin and wear tin bells around their waist. They make their way from house to house chasing away the evil spirits. Those who are visited by the “brondosi” consider themselves lucky and think they will have a prosperous year. 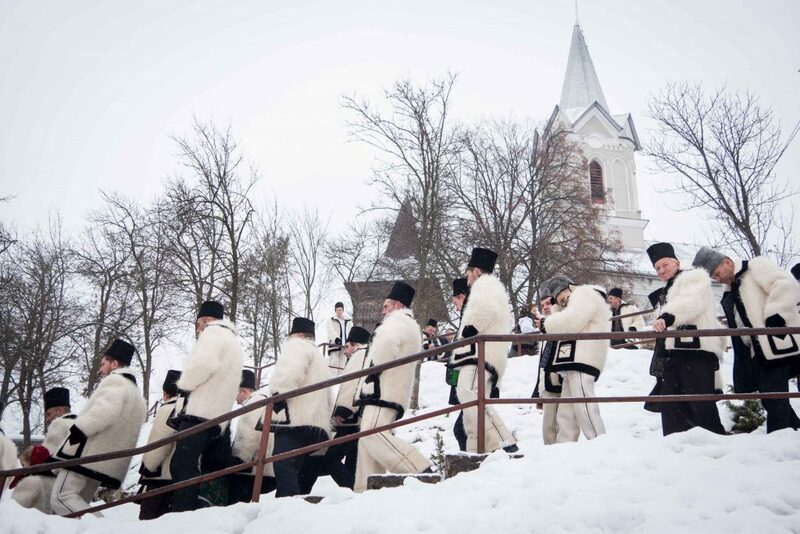 Some of the best winter festivals where you can meet carolers are the ones taking place in Sighetul Maramiei, Iasi, Borlesti, Comanesti, Piatra Neamt, Suceava and Saliste. If you ever wondered how the Ice Queen felt living in a castle made entirely of ice, now you have the opportunity to experience it! The Ice Hotel opens a few days before Christmas and is located in the Fagaras Mountains at an altitude of over 2000 m and it exists only for a few months every year. You’ll be able to sleep in one of the 14 double rooms or six private igloos at a temperature between -2 and +2 degrees Celsius. But don’t worry – every bed is covered in soft, fluffy blankets that are sure to keep you warm during the night. The memorable experience is completed by a meal in the hotel’s restaurant, where savory traditional dishes are served on plates made of ice. 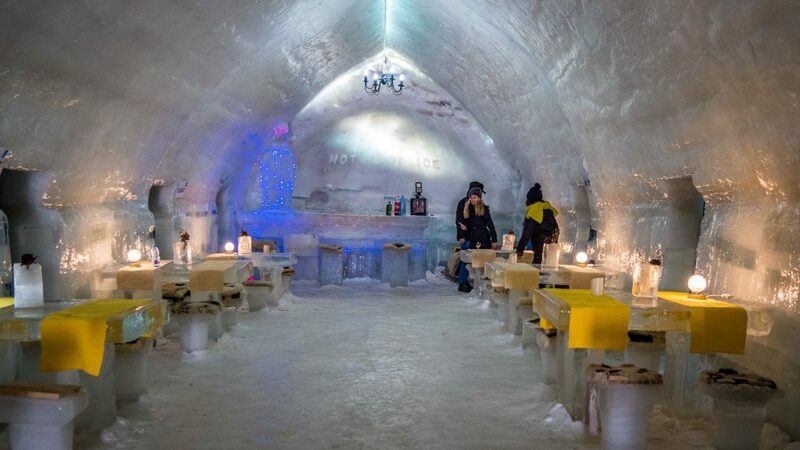 You can also have a drink at the ice bar or visit the ice church. Though Romania is not near the Polar circle, dog-drawn sleigh is a fun experience which can be experienced here as well and the period after Christmas is when snow is expected. Riding a dog-drawn sleigh is perfect for those who want to take in the beautiful mountainous scenery and enjoy a bit of adrenaline. 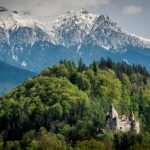 In Romania the best place for this unique adventure are the Harghita Mountains. 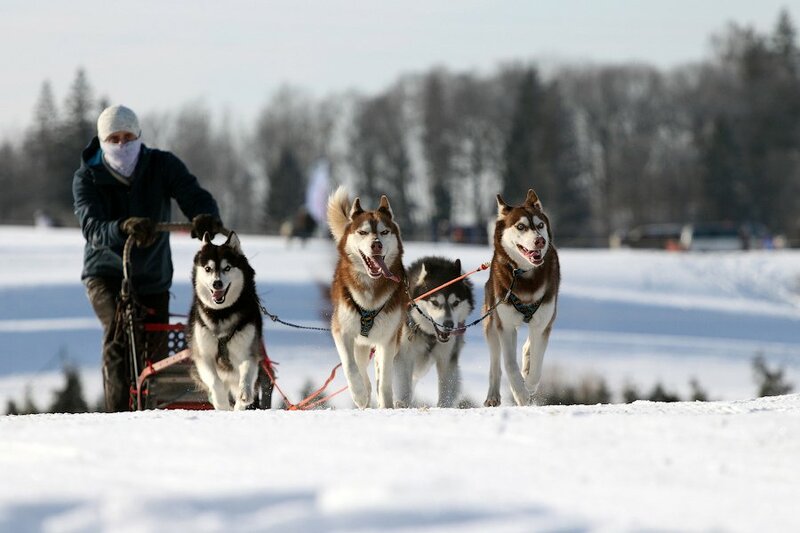 You can glide through the snow-covered trails in a dog sledge pulled by a team of Siberian Huskies. Apart from admiring the winter landscape you can also learn about the habits of these animals who love to pull. Rides in carriages drawn by horses are also available and allow for the discovery of the beautiful trails at a slower pace. 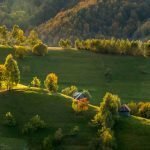 The Romanian Carpathians may not be the Alps, but one third of the country is covered in mountains so there are enough possibilities for having a good time! With over 150 approved ski slopes, the Romanian ski resorts of Poiana Brasov, Straja and Predeal are always full in winter. 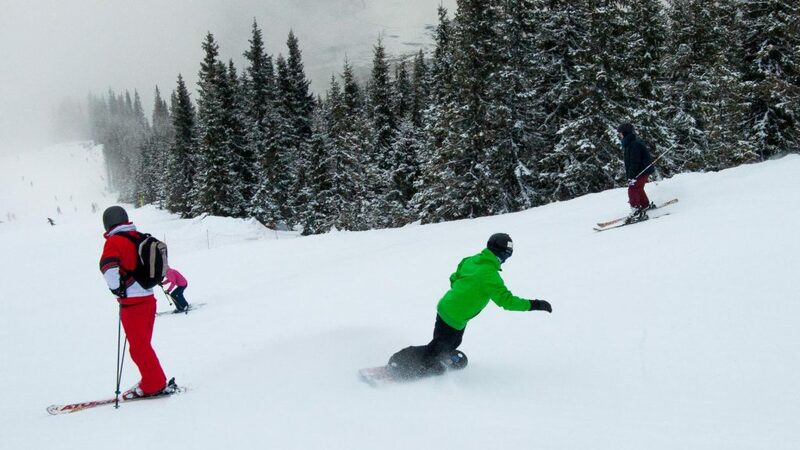 Whether you like skiing, snowboarding or sledding you’re likely to have a great time, surrounded by the clean winter air and the imposing mountains looming around you. So this is a good option to burn some of those calories from the sausages. The tradition of organizing Christmas Markets in Romania started in 2007 in Sibiu, when the town was chosen Europe’s Cultural Capital. Usually, a giant Christmas tree stands out through the rows of tiny lights that adorn the buildings and the various stands with traditional items. At night participants can enjoy carol concerts or skate on an ice rink. 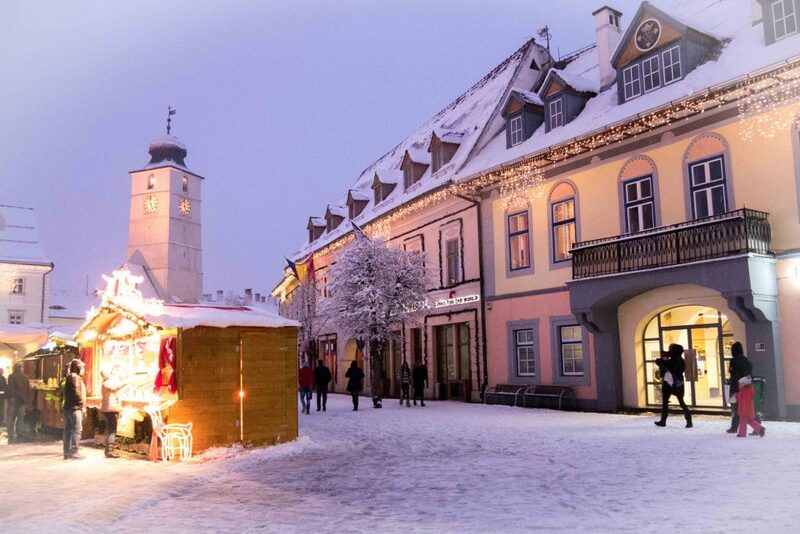 The most famous Christmas Market is still the one in Sibiu and with a reason: merchants from all over Romania gather in the Great Square and create an unrivaled festive atmosphere. 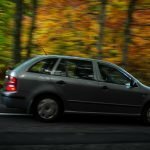 Worth a visit are also the ones in Bucharest, Brasov, Cluj-Napoca, Timisoara and Oradea. The slaughter of the pig for Christmas is a custom that has its roots in the pre-Christian era, when animals were sacrificed during the complex rituals of the winter solstice. 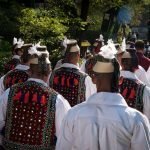 Nowadays this tradition is still kept in most rural parts of Romania, although its original significance was lost. 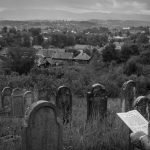 The ritual, perceived as violent by many, usually happens on the 20th of December, on Ignat day. Men wake up early in the morning and start with the killing of the pig, an event marked by a series of small rites, such as the making of a cross with the knife on the pig’s forehead. Once the animal is cut, cleaned and burnt women take over the work. They prepare the meat and cook a traditional dish called Pomana Porcului which is shared amongst the participants. From the meat that is left they make sausages and other foods in order to have a rich Christmas meal. Although Christmas has become quite a commercial holidays in recent years, in the end it symbolizes the birth of Jesus. 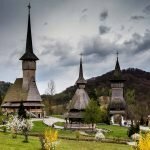 So for Romanian people, especially those in the countryside, the most important moment of the celebration is going to church. On the first day of Christmas they dress in their best costumes to show their respect for this important celebration and attend mass. In some regions of the country the religious proceedings are followed by another tradition, Viflaimul, a short theater play which presents scenes from the Bible. Once winter comes everyone dreads leaving their warm, cozy spots in their homes in order to endure the freezing temperatures. 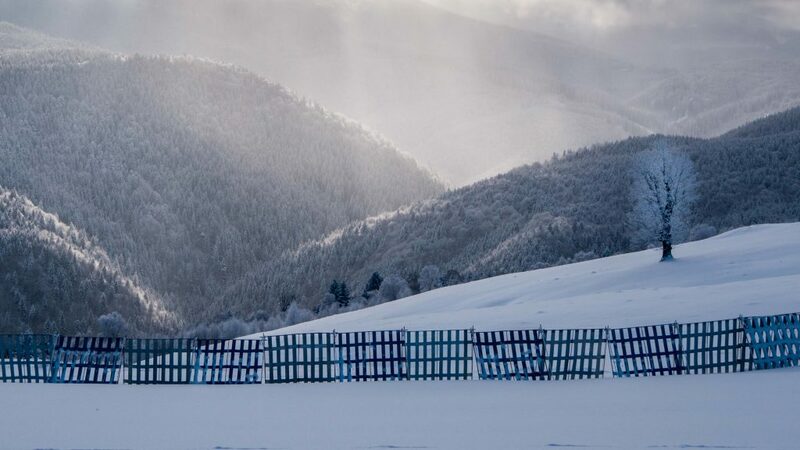 However, for Romania, a country appreciated for its beautiful landscapes, winter only comes as a blessing. The sparkly snow that covers the ground and the buildings dressed in white help create a different atmosphere: an ambience of purity and simplicity. 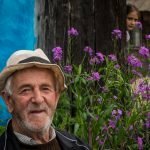 In the Romanian mountains or in the small villages, where the rowdiness of the big cities doesn’t exist, the feelings of calm and peace are even more prevalent. 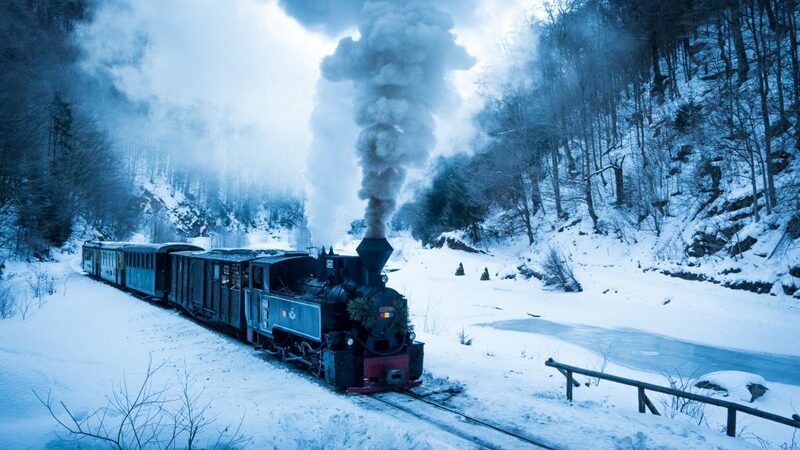 The steam train leaves from Viseu de Sus and crosses the Natural Park of the Mountains of Maramures. It moves idly deep into the snow-covered Vaser Valley and allows you to admire the green forests, hear the stream of water and inhale the fresh air of winter. 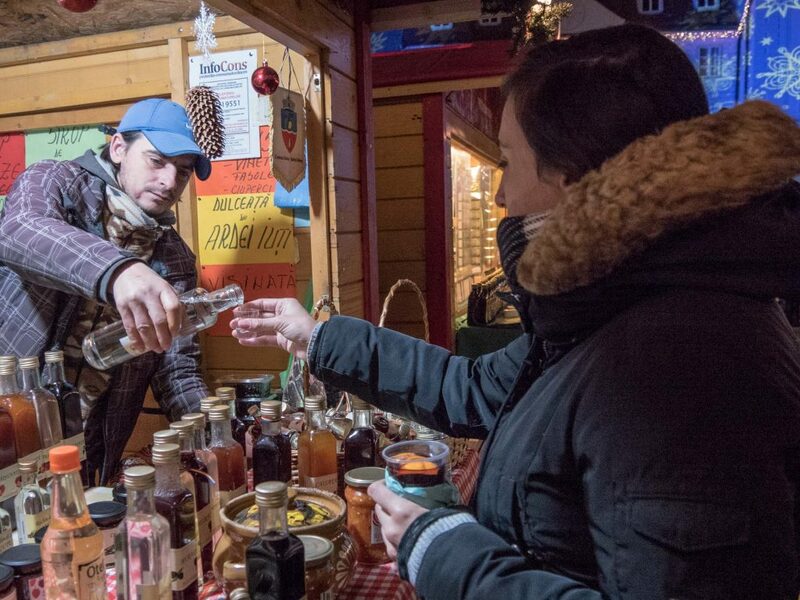 During the 6-hour trip you’ll be served a glass of horinca, a Romanian traditional alcoholic drink that will be sure to keep you warm, as well as a coffee, a snack and even a grill. The train runs even on Christmas day and for a few hours you’ll feel as if you’ve stepped in a different time and space. We hope we convinced you of what’s so great about spending Christmas in Romania. If you fancy doing something a little different for your holidays next year, we are waiting for you!